In Young Justice, being a teenager means proving yourself over and over-to peers, parents, teachers, mentors and, ultimately, to yourself. But what if you're not just a normal teenager? What if you're a teenage super hero? Are you ready to join the ranks of the great heroes and prove you're worthy of the Justice League? That's exactly what the members of Young Justice-Robin, Aqualad, Kid Flash, Superboy, Miss Martian and Artemis-will found out, whether they have what it takes to be a proven hero. Based upon characters from DC Comics. 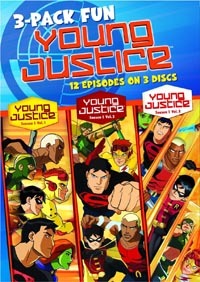 This collection includes the first 12 episodes of the series.